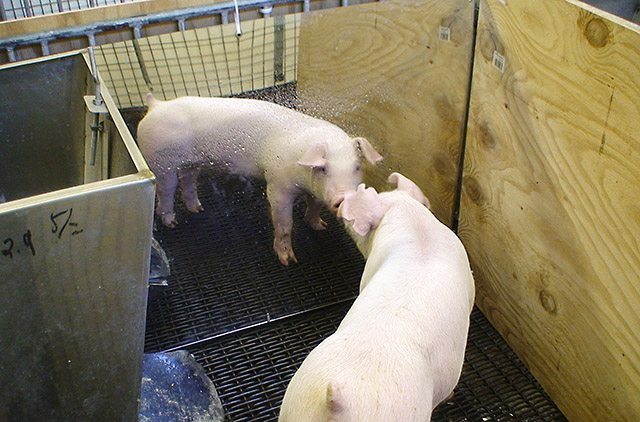 ARS scientists found that pigs preferred to be in pens with mirrors and rubber mats. What a pig sees when it looks into a mirror may help Agricultural Research Service (ARS) scientists improve livestock housing. Studying livestock behavior, stress and other well-being and production factors is the job of animal scientist Jeremy Marchant-Forde and his colleagues at the ARS Livestock Behavior Research Unit in West Lafayette, Indiana. Improving an animal’s environment can reduce stress, which in turn, enhances well-being, growth, and efficiency, and decreases disease susceptibility. In a study, Marchant-Forde looked at different types of pig pens. Pigs had access to a standard pen with a metal floor (the “control” pen), one with a rubber mat on the floor, another with a mirror and a fourth with a view of another pig across a passageway. Pigs preferred spending 40 percent of their time in pens where they could see another pig. They spent 10, 20 and 30 percent, respectively, in the control, mirror and mat pens. In a second experiment, scientists examined which pens pigs preferred when a person was present. When a person was in sight, pigs spent nearly 90 percent of their time in either the pen with the mirror or where they could see another pig. Marchant-Forde hypothesized that pigs saw their reflection in the mirror as a companion, but more research is needed for confirmation. Having mirrors in a commercial production, where pigs are kept in groups, would not be feasible, Marchant-Forde notes. However, producers could consider using rubber mats to help improve the pigs’ environment, which may help reduce stress and promote health and productivity. Read more about this research in the June 2017 issue of AgResearch magazine.